5K Obstacle Course - Factory Directly Cheap Price Adult Obstacle Course BY-5K-003 - Guangzhou Barry Industrial Co., Ltd. While millions of Americans every year enjoy the physical, mental, and spiritual benefits running provides, it isn't any secret it can get pretty boring. Traditional corporate runs can help by providing a friendly environment, a sense of camaraderie, and plenty of fun afterwards but the race themselves are still monotonous and uninteresting. Incorporating an obstacle course is a great way to liven things up but a permanent course is a wasteful use of space and can damage the surrounding environment. And who wants to hang out with their friends and coworkers afterwards covered in mud? 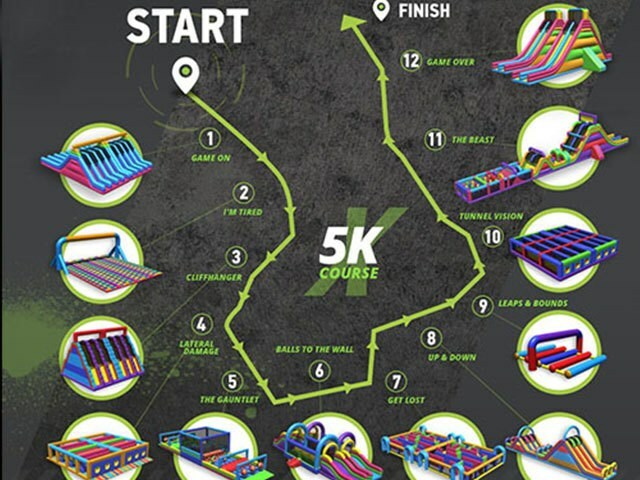 Our solution was to add inflatable obstacles and the Xtreme Air 5K obstacle race was born! Each member of our obstacle course is custom designed and fabricated with top-of-the-line materials and fastened to the ground with high strength steel alloy stakes and heavy retention straps. All of our obstacles over a certain height include fine mesh safety screening. This provides all our participants a safe environment to push themselves physically while still having a great time doing so. Game On - Let's you know what you are in for! I'm Tired - Haha! Exactly what you'll be telling yourself. Cliffhanger – Yes, we really have obstacles that tall. Leaps and Bounds - Trust us, it's harder than it looks. The Gauntlet - Don't let the giant balls get in your way! Balls to the Wall - Watch your step! Get Lost - We'll send a search party for you. Up and Down - Hold on to your lunch! Lateral Damage - Duck, dive, and scramble your way through! Tunnel Vision - Hang tough, you're almost done. The Beast - No, your eyes are not lying to you. Game Over – Last but certainly not least!